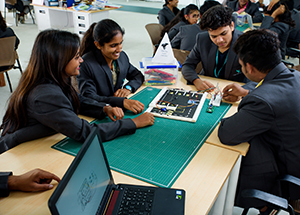 A balanced design and flexibility of the curriculum including generative design, non- conventional energy, 3D printing technology enable students to bring their most creative ideas for fruition in rapidly evolving technologies. 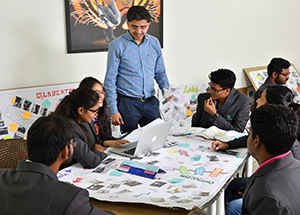 To become technology-savvy in their domain, students can undertake interdisciplinary projects suiting industry applications. Some potential career options for a graduate of this program include the roles titled Mechanical Design Engineer, Noise and Vibration specialist, Mechanical Stress Engineer, or Specialist – IC Engines and Refrigeration. This lab acts as a supplement to theory subject Mechanics of Materials. 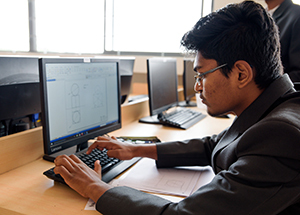 Students acquire the knowledge of engineering properties of materials and their applications. The lab has equipment for testing of materials for their mechanical properties. 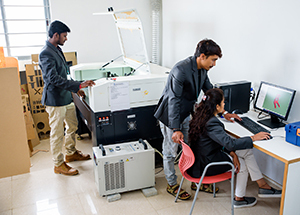 Students conduct experiments on Universal Testing Machine, various hardness testing machines (Rockwell, Brinell, Vicker’s), Wear, Impact and Torsion testing machines to characterise variety of engineering materials based on their properties. Mechanical Engineers need to visualize a machine or its components before it is manufactured this is facilitated by Design drawings. In the current industrial trend CAD modelling is an imperative skill expected from all Mechanical engineers. Students practice the development of 3D drawings of machine components and perform virtual assembly using industry leading mechanical design software “Solid Edge ST 10”. The lab is equipped with high end computer systems having latest Solid Edge ST 10 software. A foundry produces metal castings. Metals are cast into shapes by melting them into a liquid, pouring the metal into a mould, and removing the mould material after the metal has solidified as it cools. The most common metals processed are aluminium and cast iron. However, other metals, such as bronze, brass, steel, magnesium, and zinc, are also used. In this process, parts of desired shapes and sizes can be formed. Students are given hands on training to realise the processes involved in manufacturing machines. Students can fabricate their projects using the shop equipment. 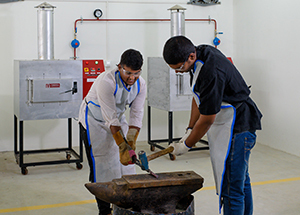 This course imparts knowledge of machining skills and basics of metal removal process. The Machine Shop is equipped with Centre Lathes, Drilling Machines, Shaping Machines and Milling Machine. Also, the machine shop is equipped with high quality cutting and precision marking tools. The students learn about the working principle of various cutting tool used for machining purpose in industries. Fluid Machinery is used for conversion of fluid energy into mechanical energy. Students explore the forces involved in fluid flow. It covers measuring devices and techniques, error analysis in experimental works and analysis of assumptions in the theory of fluid mechanics. Individual experiments are conducted on calibration of veturimeter, orificemeter, flow nozzle, V-notch etc. It also includes experiments on impact of jet on vanes, determination of major and minor energy losses, friction coefficient etc. 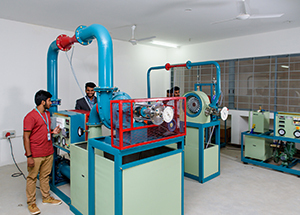 Group experiments consists conduction of performance test on Pelton wheel, Francis and Kaplan water turbines, single stage and multi stage centrifugal pumps, reciprocating pump, reciprocating air compressor and air blower. CIM embodies three components essential to the implementation of flexible design and manufacturing: the means for information storage, retrieval, manipulation and presentation; the mechanisms by which to sense state; and modify substances and methodology by which to unite them. 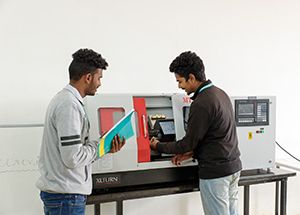 With the inception of computer integrated manufacturing machine in manufacturing setup, precise and reliable machine without human intervention during the machining process has enabled reduction in operational hazards in the job. 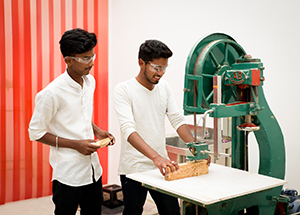 The students are trained to learn and demonstrate the above in the form of exercise using CNC machines. Metrology and Measurements Laboratory provides practical knowledge in precision geometrical measurements. MMM is equipped with various basic mechanical and optical instruments for precision measurement of length, angle, force/pressure, strain, temperature and surface integrity. 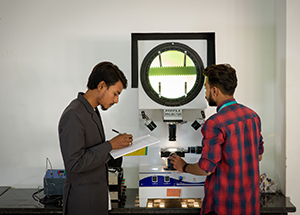 In this lab students acquire practical knowledge in calibrating systems used for the measurement of various physical parameters like force/pressure, strain, temperature etc. Metrology is the science of measurement, which is divided into three basic overlapping activities. The first being the definition of units of measurement, second the realisation of these units of measurement in practice, and the last traceability, which is linking measurements made in practice to the reference standards. 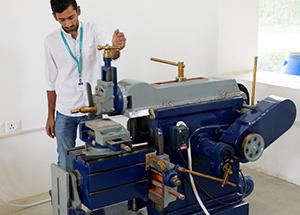 The lab is designed to train the students in the design test and operation of internal combustion engines. Students conduct experiments on performance, operation, fuel requirements and environmental impact of IC engines. Students explore the design features and operating characteristics of different types of internal combustion engines. 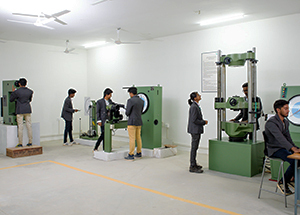 Facilities are provided to evaluate the engine performance using a computerised engine test rig. Apart from linear modeling which takes one step further, the skill set of students in non-linear structural modeling& analysis in the framework of the finite element method is required to solve real time problems. The engineering practical experience with the modeling pipeline of commercial FE software is carried out for industry with a special emphasis on implementation of physical and geometric non-linearities. The lab focuses on practical study of static and dynamic forces, with the study of vibration and degrees of freedom for mechanical systems. Students demonstrate operation of machine kinematics and dynamics such as governors, gyroscopes, balancing machines and universal vibration facilities. Experiments are conducted to calibrate photo elastic materials using photoelasticity.